The sensory bin I use for Nursery Rhyme week is one of the easiest ever. I grab our bin of pom poms from the art closet and dump it in the bin. I could probably just leave it at that and the kids would be thrilled. I did go to Making Learning Fun and add the Shear the Sheep game pieces as well as adding some foam nursery rhyme pieces to sort as well. You can find some pom poms below with an affiliate link or head to your local craft store. We also made use of our dot markers and letter tiles during nursery rhyme week. Making Learning Fun also had a set of Jack and Jill letter tile cards that I liked because there were several short words to build, which helped to encourage students who had not tried this type of center before to feel successful. I created my own dot marker sheet for Hey Diddle Diddle. Students had to dot all the cats one color, all the dogs another, and so forth. Still perfecting this project, so if you have any other nursery rhyme printable ideas, please let me know as I would like to add a set of ideas to my shop soon. Be aware if you use dot markers that smell you may end up with a kid with a strange colored nose as I did this week. The set below does not smell, but the kids do enjoy the ones that do. I used one side of my easel for students to retell several nursery rhymes. You can see above that someone was mixing together Jack and Jill with Humpty Dumpty. The Jack and Jill set came from Sunny and Bright in Primary. I just cut out the retelling set, laminated them, and added some velcro to the backs. The Humpty Dumpty set was printed on milk filters. I trimmed the ones below to fit in my printer and then printed the pages. I then cut them out. Students hands do need to be dry in order to play with these. They stick to the felt board fairly easily. I found the Humpty Dumpty pieces at KizClub. Some of our Nursery Rhyme games went with Itsy Bitsy Spider and Humpty Dumpty. The Itsy Bitsy Spider path game was found here. I added a couple plastic spiders that I had probably purchased at the local dollar store as well as some dice. The Humpty Dumpty game has two game boards and students take turns picking a card to complete their Humpty Dumpty puzzle. Sometimes they get the card they need and sometimes they do not. In our writing center we spent some time reviewing some of our alphabet letters and using them to make three letter words. I used a roll and graph from This Reading Mama along with the alphabet stampers. I made some of the printables go only up to five since I wanted students to play until one of the words won and many students don’t quite have the stamina to stick with it until ten unless it is a teacher guided activity. I think the alphabet stampers I have are discontinued since I cannot find them online, but you try something similar to the ones below. I chose to only give my students the ones they might need to complete the activity instead of the entire set. Another alphabet review activity was on one side of the easel. I used one of the pages of my Alphabet Magnet Match along with alphabet magnets. As you see I use super fancy painters tape to put my magnet match on the easel so that students can put the alphabet magnets on the matching picture. I have several sets of alphabet magnets, including the ones below. Sometimes I put out just capital letters, other times a mix, and sometimes just lowercase. These are just a few of the nursery rhyme activities that we completed during our study. 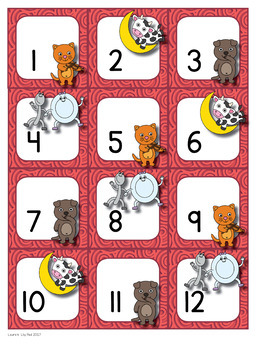 We also used my Nursery Rhyme calendar set during circle time. My students also loved finding the kitten who was lost in the mitten. 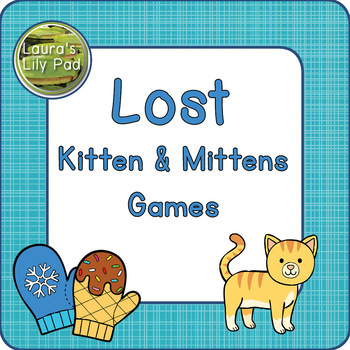 We had played games similar to the Lost Kittens and Mittens Game before on the pocket chart so they were already playing it during the first centers time before I even had a chance to share it with them. 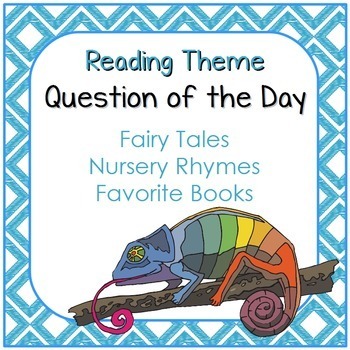 We also used some questions from the Reading Theme Question of the Day set during this week. What are some of your favorite nursery rhymes and activities?